In a medium, deep skillet, heat 1/4 inch of vegetable oil until hot. Fry one tortilla at a time over moderately high heat until lightly golden on both sides, about 2 minutes. Drain on paper towels and sprinkle with salt. Preheat a grill pan. In a medium bowl, toss the shrimp with the 1 teaspoon of vegetable oil and the chipotle chile powder. Season the shrimp with salt. Grill the shrimp over moderately high heat, turning once, until they are browned in s and cooked through, about 4 minutes. In a medium bowl, toss the cabbage with the tomato, scallions, sour cream and lime juice and season with salt. 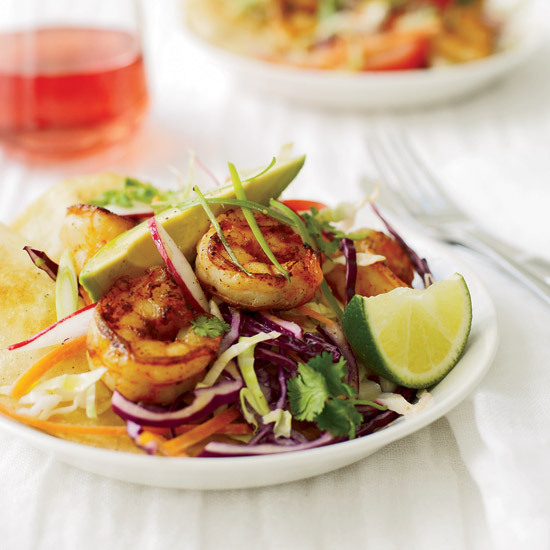 Set the tortillas on plates and top with the cabbage slaw, chipotle shrimp, avocado, radishes and cilantro. Serve with lime wedges. Review Body: I've made this recipe many times. Easy and great with flavor. A keeper. Review Body: This is really good...much better than I thought. I used 10 shrimp with 1/2 teaspoon of chile powder for the 2 of us, 2 cups of slaw, half tomato, &amp; 2 scallions with full amount of sour cream and lime juice. I sauteed the shrimp which was fine and easier than cranking up the grill. Great weeknight dinner or perfect for a luncheon entree.